Charming and subtly feminine, this conversation sofa is a great centerpiece for traditional, cottage, or French Laundry-style living rooms. 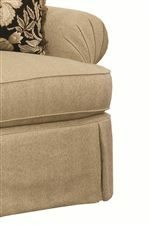 The curved sofa is framed between rolled, fan-pleated arms and comfortably supported by thick, knife-edged back cushions. Flowing waterfall skirts provide an elegant finish. The Danbury Traditional Conversation Sofa with Waterfall Skirts and Fan-Pleated Arms by Kincaid Furniture at AHFA in the area. Product availability may vary. Contact us for the most current availability on this product. Frame Construction Select laminate hardwood prevent warping and provide years of service. Seat Support Furniture that contains springs has “S’ shaped springs tied together with steel wire to ensure a consistent seating platform. Padding & Ergonomics Densified batting covers all spring under sateen. The generous proportions of Danbury upholstery are designed to perfectly fill your larger living room space with comfort and enviable classic charm. Both the Danbury chair and a half and grande sofa are elegantly designed with tailored waterfall skirts, fan-pleated arms, and curved, conversation-style seats. 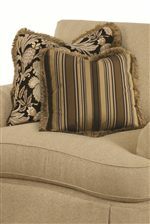 Easily able to fit your color scheme, these pieces are available in any combination of our 600 body and accent pillow fabrics. The Danbury collection is a great option if you are looking for Traditional furniture in the area. Browse other items in the Danbury collection from AHFA in the area.